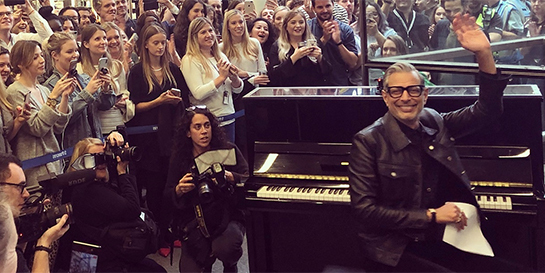 As well as his public piano performance, which was combined with some entertaining improvised comedy, Jeff visited Decca's new King’s Cross offices and picked up a GQ award on Wednesday night. He and his band, The Mildred Snitzer Orchestra, will return to London in November for their first UK live shows, performing at Ronnie Scott’s and Cadogan Hall, before taking the show to venues in Paris and Berlin. Goldblum, who has been playing the piano since he was a child, has performed with his jazz band at venues in New York and Los Angeles over the past few decades. The atmosphere and energy of these shows is captured perfectly on his new album, out November 9. Decca senior director of A&R and creative strategy Tom Lewis says, “Jeff Goldblum is possibly the most charismatic man in the world! He absolutely radiates star power and he leaves happiness in his wake. His visit to the building created the most fabulous buzz. What a way to christen our new offices. I love that people in the building suddenly found themselves in a lift with Jeff Goldblum. The album repertoire includes favourite 60s jazz numbers Cantaloupe Island and I Wish I Knew (How It Would Feel To Be Free), the 1940s classic Straighten Up & Fly Right with guest vocals from Decca’s own Imelda May and My Baby Just Cares For Me featuring American songstress Haley Reinhart. The band are also joined by the extraordinary Grammy-nominated trumpeter Till Brönner.